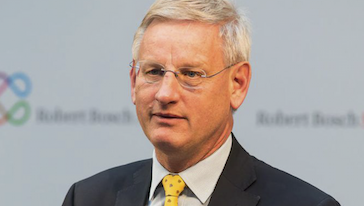 Carl Bildt has served as both Prime Minister (1991-1994) and Foreign Minister (2006-2014) of Sweden. Subsequently he served in international functions with the EU and UN, primarily related to the conflicts in the Balkans. He was Co-Chairman of the Dayton peace talks on Bosnia and become the first High Representative in the country. Later, he was the Special Envoy of UN Secretary General Kofi Annan to the region. Returning as Foreign Minister of Sweden in 2006, he come to be seen as one of the most prominent and vocal of European foreign ministers during those years. He was one of the initiators of EU’s Eastern Partnership, and pushed the EU forward also on issues of the Middle East.